Welcome to the Diamante Valley of Costa Rica! Join Zander Hathaway and friends in the heart of the Diamante Valley, among pristine jungle, abundant fruit forest, and spectacular waterfalls. Enjoy an abundance of organic tropical fruit and raw vegan cuisine by Chris Kendall of The Raw Advantage. Explore nature in a peaceful and safe clothing-optional environment. All activities are optional. Savor the best local, organic, seasonal fruit and raw vegan cuisine. Eat straight from the food forest and enjoy the all-you-can-forage buffet with fresh fruits, leafy greens, and gourmet, raw, vegan cuisine. Feel free to eat with your hands and play with your food. Practice yoga and ecstatic dance, on or off the rainforest deck. Integrate your mind and body with an intuitive and interactive flow of techniques to restore your natural breathing and movement patterns. 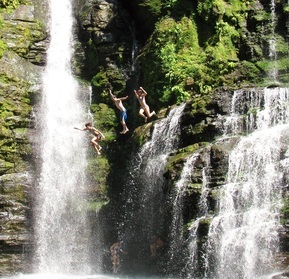 Access epic waterfalls and secluded river with natural pools anytime. Explore the river, swim in natural pools, rock climb, and make a splash! Feel free to go without shoes or clothes. Feel the profound health benefits of connecting with the Earth's electro-magnetic field. Allow direct sunlight on your body, as all wild apes do. This is a safe, respectful, clothing-optional environment for naturists. Swimsuit required in public waterways. Detox from modern technology and lingual communication. Experience deeper peace and increased sensory awareness with silent mornings and a full day without symbolic language or other modern technologies. Enjoy massage trades and social grooming. Connect with others through touch. Practice communicating your personal boundaries and respecting others. Let go of the programming and conditioning of industrial culture. Restore your youthful vitality, creativity, playful spirit, and sense of wonder. Experiment with primitive tools and fallback foods. Humans once thought of ourselves as the only tool-making animal, but now it is well known that other apes make simple tools to forage fallback foods. Make new friends and strategic alliances. Best buds may be few and far between, but at an Ape Living retreat, you are sure to meet a few new friends who share your interests. Hang out in a hammock or make a tree nest. All activities are optional and there will be plenty of free time to kick back and listen to the songs of the jungle. Your privacy is guaranteed. We will not spam or share your personal information. Our daily flow will transition from being associated with numerical time to the natural light cycle. We will stay up past dark the first night, with a bonfire for our opening circle and personal introductions. The fire will be doused in a ceremony marking our movement away from modern technology and into our primal nature. During the retreat, we will transition from using symbolic language to more basic communication. Our diet will start with fairly simple raw vegan cuisine and shift to sequential eating and mono-fruit meals. On the last night, we will rekindle the flames, conclude our experience, and celebrate our return to civilization, rejuvenated and more deeply rooted in nature. Stay tuned for the announcement of our 2020 retreat details!